Greetings! Classes have begun and first-years are getting used to many new things from taking classes with 300 other people to doing their own laundry. In the mix of it all, there are many activities that have been held to welcome the new students to Grounds including Opening Convocation, the Student Activities Fair, and the annual Tom DeLuca's Hypnotist show. As part of this mix, there was Project SERVE, which was a one-day service project held this past Saturday. Project SERVE is an annual event with two main purposes: to introduce incoming students (yes, that includes transfers!) 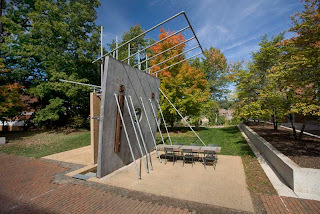 to service learning opportunities at UVa while creating a venue to build new friendships among like-minded volunteers. It has to be held on a Saturday due to classes and early in the morning (9AM!) to accommodate the sites, but check out the turn out we had(the free breakfast doesn't hurt though)! This year, we had close to 30 sites all over Charlottesville including local parks, nursing homes, schools, and non-profit agencies. To the left are two students who are taking part in a car wash to benefit the Sexual Assault Resource Agency. After the sites were done with their projects, we invited them to come back on Grounds to attend ServiceFest which is an annual activities fair held specifically for service oriented organizations such as Global Medical Bridges, FACE AIDS activism, and Madison House, our student volunteer center. Below are some pictures post-project as sites are reflecting on their service and enjoying some yummy pizza and cookies! This past spring's dance show. 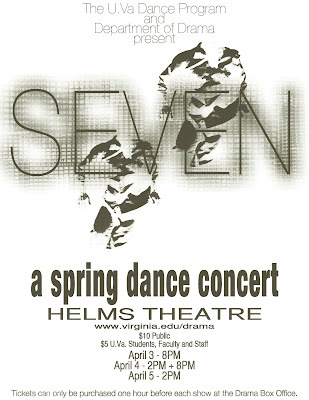 The dance department here at UVa started in 2006, and it currently offers a minor (although we are avidly working towards creating a major). The minor's made up of 21 credits' worth of performance, lecture, production, and technique requirements, and you can look at the requirements here at http://www.virginia.edu/drama/danceminor.htm . There is no audition required to be a dance minor although a background in dance is preferred. You can also get a feel of what kind of dance classes are offered here by looking at that list. That said, you do not have to be a dance minor to take any of these classes. All of the dance classes are open to anybody and everybody who's interested. That means that you can still take the Modern, Ballet, or Jazz technique classes that we offer regardless of your major/minor, and we put on a production every semester that is open to anyone that wants to audition for it. 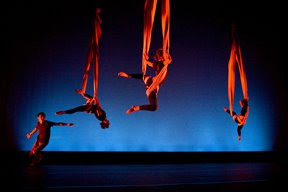 Below, in the "Fine Arts" blog post, you can see some pictures from a previous guest artist, Gesel Mason, and the aerial piece from our fall dance show. We also have lots of club and ensemble groups covering all kinds of dance, whether ethnic, liturgical, ballroom, hip hop, ballet, or modern. Some are focused on specific types; for instance, Rhapsody Ballet Ensemble does only, you guessed it, ballet and Mahogany Dance Troupe does hip hop. Then we have other organizations that cover all kinds of dance like the University Dance Club (UDC) which has every type of dance from tap to jazz to ballet. To see the list of all of the dance club/organizations on grounds, type "dance" into the search box and click on one of the groups that shows up on the drop down list at http://atuva.student.virginia.edu/. That search will only yield dance organizations with "dance" in their name, so try specific types of dance like "salsa" if you're having trouble finding one that covers your dance interest. The Downtown Mall is home to many of the dance events that happen here in Charlottesville. I've gone to the Live Arts Theater and the McGuffey Arts Center to see various dance productions, and the local Piedmont Virginia Community College also does many dance productions every semester. There are also some dance studios in and around Charlottesville like Zabor Dance Academy which specializes in social and ballroom dancing and which is located near the Downtown Mall. Wherever you go for school, I have a few suggestions as to class choice. For starters, take professors, not courses. Professors can have a phenomenal impact on their students. An amazing professor can turn dirt into gold, opening your eyes to horizons you had never known existed while a terrible professor can make you want to change your major. Expand your views by signing up for a professor with views different from yours. Frankly, if you're going to college to have all of your views reaffirmed, don't go; you already know everything. My last piece of advice is to take advantage of courses that are on a time basis. What I mean by that is UVa has courses that only specific years can take. Take them; you have such a limited opportunity to experience them that you shouldn't squander any. These are classes capped at under 20 students and led by phenomenal professors. As a First Year in my first semester, I had Dr. Wormington as one of my professors. Not only was he extremely approachable and personable, he was the Director of Undergraduate Programs, so right from the start I got to see the head of my major department. When I first heard of University Seminars, my impression was that they were watered down courses for students who weren't ready for the big time college scene. I. Was. Wrong. They are amazing. While signing up for classes, I saw a class entitled Clones and Genomes and was too intrigued not to sign up for it. I'm so glad I did. Our class discussed the ethics and methods behind how to clone frogs, sheep, and humans. By no means was the material elementary: we delved into the techniques and ethics headfirst. About a third of the class was against cloning, a third in favor, and a third uncertain. Having seen Dr. Wormington's views, I asked where I should go for the other point of view. I know what I think now, but I want to hear the arguments from both sides. For that reason, I want to take a course in the Religious Studies department. One thing I truly love about this university is the fact that there are so many fun and exciting things to do on the weekends here on grounds. Even though UVA is in such close proximity to some large cities such as Richmond and DC, (and definitely is students need to travel outside of Charlottesville they can easily do so with our Amtrak Station, Greyhound bus services, and through our Charlottesville Airport and Richmond Airport), there are countless activities happening here on the grounds of the university throughout the weekends that students won’t want to leave! Some of my favorite activities happen to run through our Fine Arts Program. Every single semester, each student receives an unlimited amount of Arts$ attached to their student ID card. These arts dollars can be use d by students to attend any type of musical venue or drama event put on through UVA’s department, as well as the Virginia Film Festival that takes place in the spring semester. Nearly every single weekend, there is an activity put on – whether it’s a stage production, a musical concert, or even a dance concert. It is really neat to be able to attend any of these venues and become exposed to something I am not totally familiar with. Two of my favorite dance productions that I attended this past fall with a few of my closest buds were “Strands in Motion: Fall Dance Concert,” as well as “No Boundaries: Dancing the Vision of Contemporary Black Choreographers.” Personally, I can’t dance or drop a beat to save my life, and therefore, I feel I have a greater appreciation for students and peers that can. It’s really awesome to know that I can go out and basically for free support one of my classmates through a drama department event. For students who are interested in studying through the Department of Drama , there are many academic programs the department has to offer (both for undergraduate degrees as well as Masters degrees. Whether you want to be the star of the show on center stage or work behind the scenes specializing in costume, lighting and set design and/or technical direction, our Drama Department offers endless opportunities for these interests and is a fantastic place for students to start out! Three years ago, I started applying to architecture schools around the country. Two days before I accepted my offer of admission, I talked to a friend who was already in an undergraduate architecture program, and he explained to me all about the differences between four-year and five-year programs. I think that making the decision of whether you want a four or five year program is an integral part of the application process, seeing as it simplifies everything and the decision-making process that is bound follow. I knew that schools offered different programs, but I didn’t know that these differences could have such a great impact on your experience in one of the country’s undergraduate architecture programs. I am thankful that I had that talk before I made the decision of going to a five year program, because otherwise, I might have gotten myself into something that I didn’t really want. However, I almost wish that I had those major differences clarified to me earlier on in the process, so I could eliminate the programs that I didn’t think would be a right fit for me earlier on in the process, saving me a lot of money and a lot of time! There are two main streams you can go into as an architecture student. You can do a four year program, from which you will graduate with a Bachelor of Science in Architecture (some Bachelor of Arts programs are offered) which is a four-year program, or you graduate from a Bachelor of Architecture (more common) which is a five-year program. 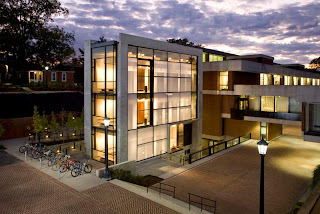 The University of Virginia offers a four-year Bachelor of Science in Architecture. I can’t say that one program is harder that the other, they’re just different. And you should base your decision not on what you want to do during your time as an undergraduate, but on what you don’t want to do. So here’s what it comes down to: to become a licensed architect, you have to do 10 studio sessions, and a number of hours of internship. Studio is basically where you’ll be spending most of your time as a student, where you have a desk set up and a drafting board/computer, and work on designs pretty much 24 hours of every day of the week. Now in four-year programs, like UVa’s, you don’t go into studio your first year, you go into studio your second year, which means that by the end of your four year, you’ll have done 6 studio sessions (one per semester). In five-year programs, you go into studio your first year, and therefore graduate with ten studio sessions, by which time you can sit for the licensing examination. The fact that you graduate with 6 studio sessions from four year programs automatically means that you’ll have do two more years of graduate school. Whether you want to go into grad school directly after you graduate or maybe work for a couple years then do grad school is another thing. However, the bigger picture is that you will end up graduating from school with a master’s degree as opposed to just a Bachelor of Architecture (that five year programs offer). That being said, students graduating from 5 year programs can go into grad school and graduate with a masters in 1 more year, totaling 6 years (which is exactly what you’ll be spending in 4 year undergrad school + 2 in grad school for the other option). So really, it ends up being the same, the only difference being that four year programs allow you more flexibility in terms of taking a bunch of electives your first and second years and being more active in the university community as an undergraduate student, buying you more time to find out whether architecture is really right for you or not. The reason I’m thankful that I found out about the difference between the programs before I accepted the offer is that if I ended up in a five year program, it would have probably been too rigorous from the start that I wouldn’t have been able to do all the other things (academic and non academic) that a four year program has given me the flexibility to do. 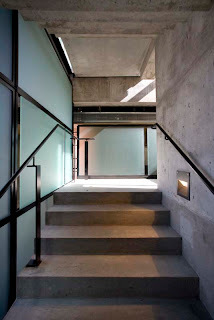 So, really, it just comes down to what you want out of a learning experience and whether you’re really dying for the license to practice architecture right out of an undergraduate program. 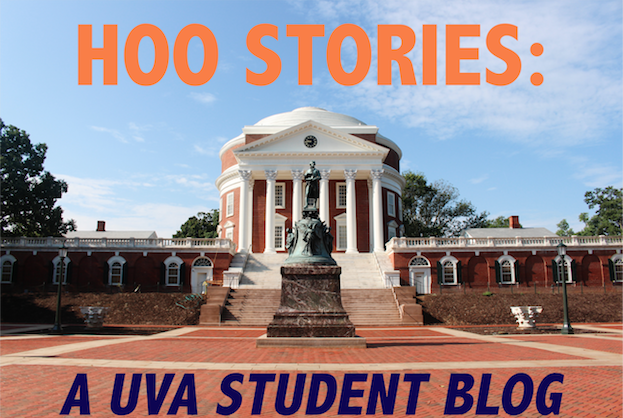 I was thinking of my next post topic and while Googling UVa, came across some great videos of students who were sharing why they came to UVa and what they love about the place.